The off-duty police officer who stopped the man suspected of stabbing nine people in a St. Cloud mall was naturally on the receiving end of praise for his outstanding heroics. Jason F. Falconer (above) likely saved others from harm and/or death. Falconer is a former police chief, a police marksman and the owner of Tactical Advantage and Tactical Advantage Firearms Training. Like most real-deal heroes, Falconer does not consider himself as such and has been reluctant to do interviews. “I’ve been trying to stay away from it all for the time being,” said Falconer, a medal-winning marksman who operates a firearms training business in neighboring Waite Park. St. Cloud Mayor Dave Kleis said at a news conference that Falconer’s “life was clearly in danger” during what had been an uneventful shopping trip for the part-time officer. 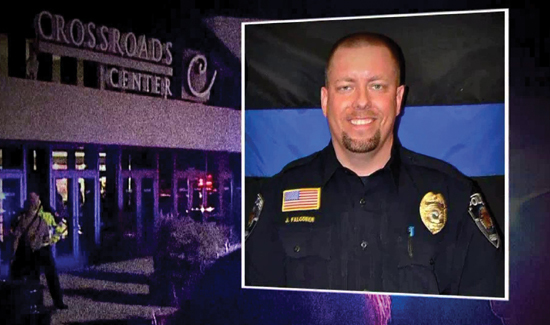 “Officer Falconer was there at the right time and the right place,” Kleis said. That place, where the assailant died, was inside Macy’s. St. Cloud Police Chief William Anderson told reporters that things could have turned out differently. “This could have been much, much worse if not for Falconer’s swift and direct response to the chaos, Gov. Mark Dayton said in a statement released to the Minneapolis Star Tribune. He added that he is deeply grateful to the heroic law enforcement officer, whose swift response prevented an even worse attack. U.S. Senator Amy Klobuchar said, “While we will learn more about the facts surrounding this horrific attack today, one thing we know for certain this morning. Due to the courageous actions of an off-duty area police officer, the good work of first responders, and the reaction of those present at the mall, lives were saved.